"An Incomplete, Ultimately Misleading Gospel"
MARY MAGDALENE is a fictionalized biblical drama about one woman who followed Jesus and later was the first person with whom he talked after his physical resurrection. MARY MAGDALENE inserts some of the biblical events surrounding Jesus and Mary, but it deletes most of the biblical dialogue to create an incomplete Gospel message about bringing love, compassion and forgiveness to the humble, poor and suffering. MARY MAGDALENE is a fictionalized biblical drama about one woman who followed Jesus and later was the first person to whom he talked after his physical resurrection. MARY MAGDALENE takes some of the biblical events surrounding Jesus and Mary, but deletes most of the biblical dialogue to create a half-hearted Gospel message about bringing faith, love, compassion, and forgiveness to the humble, poor and oppressed. The opening to MARY MAGDALENE is a little confusing. Mary seems to be a troubled young woman, but about what is unclear. Her father wants her to marry a man in Magdala, but Mary finally tells him she’s not interested. Before that’s revealed, Mary manages to help calm a young woman going into labor. At the synagogue, the people hear about the unique preaching of Jesus. One night, a distraught Mary goes alone to the synagogue to pray, but she refuses to tell the rabbi there what’s wrong. So, the men in Magdala think she’s possessed by a demon, and they try to drown the demon out of her body. Jesus comes to visit Mary and remove the demon. “I fear I shame my family,” she tells Jesus. Mary starts following Jesus and his apostles, listening to what Jesus teaches. Jesus preaches about faith and God’s Kingdom. He also tells everyone when they get baptized that they must be “born anew.” He accuses the Jewish elders and religious leaders of Magdala of being corrupt because, although they hear and even preach the Word of God in the synagogue, they don’t carry that teaching into the world outside their regular worship. He urges them to follow the Will of God in all things. At one point, Jesus baptizes Mary Himself, and Mary decides to leave Magdala and follow Jesus and his apostles. Peter, however, is skeptical, thinking that people will judge them harshly for bringing a woman along, but Judas befriends Mary and tells her that Jesus will usher in God’s Kingdom, destroy the Roman authorities and bring the dead back to life, including Judas’ dead wife and child. Later, Mary complains to Jesus that the men think they will become like soldiers. Reaching Cana in Galilee, Jesus lets Mary preach to the women by the river. The women respond to the message. Then, Mary baptizes the women while Peter baptizes the men. In Cana, Mary, the mother of Jesus, joins the group and the two Mary’s befriend one another. Later, Jesus brings a dead man lying outside some tombs back to life, but the movie doesn’t reveal the man’s name, and Jesus says nothing to the amazed crowd. Everything comes to a head in Jerusalem during Passover. Judas, Peter and the apostles seem to think that Jesus, with a snap of his finger, will destroy the Roman authorities, bring back the dead and usher in God’s Kingdom on Earth. Jesus doesn’t seem to be so sure about that, however. The rest of the movie tells what happens to Jesus in Jerusalem, including scenes of Jesus Christ’s Death and Resurrection. However, it leaves out a lot of important details from the Bible and distorts what happens when Mary Magdalene comes to tell Peter and the other apostles that she saw the resurrected Jesus. MARY MAGDALENE moves slowly and is somewhat talky. The story structure is a bit anticlimactic in too many places. Christian viewers who know their Bibles will be frustrated by the movie. Although it relates some biblical events, it leaves out most of the biblical dialogue and material that give context and meaning to those events. For instance, at the Last Supper, Jesus breaks the bread but gives the apostles no Words of Institution about the bread. Then, the scene just cuts to Jesus and the apostles in the Garden of Gethsemane. Also, during the Crucifixion, Jesus says nothing whatsoever. 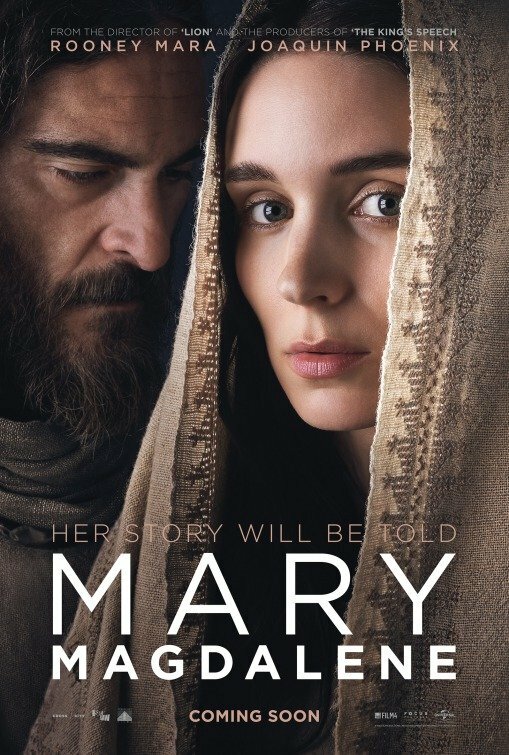 Instead of inserting biblical dialogue to give a better context to Jesus Christ’s teaching and behavior, the movie seems more interesting in giving a feminist subtext to Mary Magdalene’s life. Even worse, perhaps, instead of just lifting Mary up, the movie feels the need to tear down Peter at the same time, in a modern, false feminist manner. Thus, when Mary tells the apostles she saw the resurrected Jesus, no one rushes to the empty tomb. She also gets into an argument with Peter about the meaning of God’s Kingdom. Peter stresses the Second Coming, but Mary Magdalene tells him that’s not what Jesus meant about God’s Kingdom. She even accuses Peter of inventing his own narrow teaching that will only serve his own self-interest and that of other men. Instead, Mary tells Peter that Jesus Christ’s idea of the Kingdom of God is to bring love, care and forgiveness to the humble, poor and suffering, and thereby make the world a better, more godly place. This, of course, is an incomplete Gospel message that’s ultimately misleading because it is incomplete. If MARY MAGDELENE had inserted more of the dramatic, beautiful biblical dialogue concerning the meaning of Christ’s Death and Resurrection, not to mention the institution 0of the New Covenant during the Last Supper, it would have been a better, more complete, more accurate biblical drama. As it is, the movie sadly contains annoying false theology and false social commentary. The New Testament documents already contain many great passages that lift up the dignity of women like Mary Magdalene. Filmmakers don’t have to start looking to today’s nonsensical, silly feminist ideology to give Mary Magdalene the due that the Bible already gives her. And, they certainly don’t have to launch a specious, false attack on Peter to do it. Nor do they have to change so many details in major well-known biblical events, such as the resurrection of Lazarus. Someone here did not study their Bibles hard enough or diligently enough. Men mistreat women and the movie’s Mary Magdalene character delivers a half-hearted Gospel message, where she contradicts Peter and says that God’s Kingdom is designed just to bring faith, love, care, and forgiveness to the humble, poor and suffering. MARY MAGDALENE is a fictionalized biblical drama about one woman who followed Jesus and became the first person with whom he talked after his physical resurrection. Jesus and His apostles visit Mary’s town of Magdala. Jesus impresses Mary with His teaching about God’s Kingdom, having faith, being “born anew,” and doing God’s Will. Mary follows Jesus to Jerusalem, despite the wishes of her father. Everything climaxes in Jerusalem during Passover. The rest of the movie shows Jesus in Jerusalem, including Jesus Christ’s Death and Resurrection. MARY MAGDALENE often moves slowly. Also, it’s somewhat talky and anticlimactic. Although it relates some biblical events, it leaves out most of the biblical dialogue and surrounding material that give context and meaning to those events. Worst of all, perhaps, when Mary tells the apostles she saw the resurrected Jesus, no one rushes to the empty tomb. She also gets into an argument with Peter about the meaning of God’s Kingdom. Peter stresses the Second Coming, but Mary Magdalene preaches an incomplete Gospel message about bringing love, care and forgiveness to the humble, poor and suffering.